This article fist appeared on TheTrek. When considering the total cost of a thru-hike, one must factor not only the amount spent while hiking but also the expenditure on gear beforehand. In many cases, equipment alone can end being the largest expense by a wide margin so it’s no surprise that would-be hikers have a keen interest in seeking out the best deals. During my thru-hike this year, I racked up about $2,500 in charges for food, lodging, and other essentials. In addition to tracking my on-trail expenses, I also kept note of the amount I spent on equipment for the hike. My plan was to go “as light as I could afford” and while I didn’t have a strict budget for gear, I tried to get the highest quality items at the lowest possible price. As a result of several months of searching, testing, and negotiating, I ended up spending $2,339.06 on my gear and saved more than $2,000 in the process. Snippet of my gear list showing prices and savings. Click here to view the full sortable and clickable spreadsheet (on Google Sheets) of all my gear, the cost, and where I got the item from. Note that this list includes everything I hiked with, even though I already owned about half the items before I started gathering my AT gear. The truth of the matter is that good quality gear lasts longer and performs better than cheaper alternatives. You pay more, of course, but most companies have excellent warranties that remove the risk of having items prematurely fail and costing you extra to replace. What’s more, these high-quality items can generally be used for years on end thus retain much of their value even after a thru-hike. Moreover, buying used gear not only saves you money but it also discourages mass-produced and second rate garbage that ends up in a landfill after it breaks. Because I was planning a “fast” thru-hike (97 days), I didn’t want to worry about whether or not my gear was going to fall apart halfway through. Instead of cutting corners for a better price, I decided to invest in quality where I could. That’s not to say that less-expensive gear doesn’t have its place, but my main objective for this trip was getting a good value. 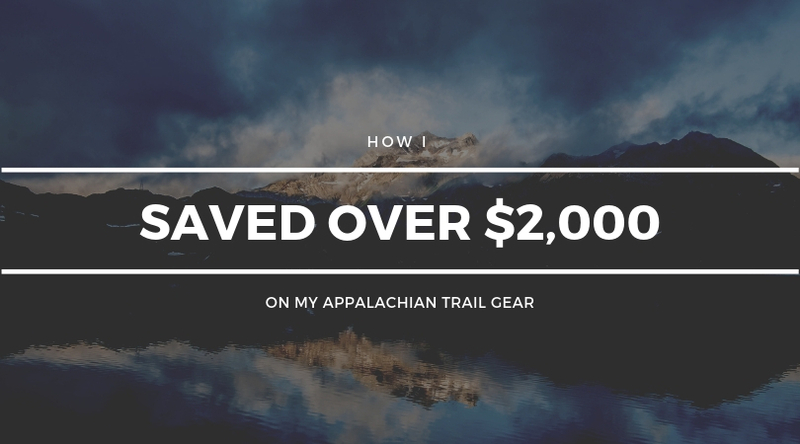 In order to save more than $2,000 on my gear, I combined a number of different strategies. No single method would have gotten me that kind of return on its own, so I implemented each when it made the most fiscal sense. There are so many places to find used gear it can be incredibly difficult to narrow down the choices. From forums to Facebook, endless sources exist expressly for the purpose of reselling used backpacking items at reasonable prices. The absolute best place I’ve found for this is LWHiker.com. This is a fantastic resource that combines used gear listings from multiple forums and websites including Reddit, Backpacking Light, Mountain Project, and more. It’s a one-stop-shop for viewing current listings or searching for specific items. You can also set alerts for specific keywords and get immediate emails when an item you’re after is listed. At lwhiker.com you can search a number of used gear sites with a single click. If you can’t find what you want at LWHiker, create a “wanted” ad of your own. I had success with this several times when I was looking for a specific item that wasn’t listed anywhere. For example, I put out an ad on Reddit’s “Ultralight Gear Trade” forum looking for a Delorme InReach (the older version – Garmin now owns the product) and within a day I had two offers in my inbox. Sometimes people don’t want to go to the trouble of putting up an ad or might even forget that they have an item until someone mentions they need it, so it can’t hurt to try. When you identify a second-hand item you’d like to purchase, try negotiating a slightly lower price. Many people (myself included) advertise items with a best-possible price in mind but are willing to accept slightly less for a guaranteed sale. Don’t insult the seller with a low-ball offer, but try testing the water by suggesting 10-15% less than the asking price (or more if you have a valid reason that you can articulate). This worked for me almost every time, and when the seller was firm it was usually for a legitimate cause. Pretty self-explanatory. If you know in advance what you want to buy, wait for it to go on sale. If the product you’re looking for is sold on Amazon, use something like camelcamelcamel to track its price and set an alert to notify you when it drops below a certain threshold. Otherwise, it’s pretty well-known that retailers drop their prices around various holidays and REI is famous for its “Garage Sales”, so if there’s something you want from them hold off until the prices are slashed. Unfortunately, most of the “cottage” companies (Zpacks, Enlightened Equipment, Superior Wilderness Designs, etc.) don’t sell to big-box retailers and rarely offer sales, so your best bet for these items is to buy them second-hand, as noted above. If you scrolled through the notes on the spreadsheet above, you’ll have noticed that I was able to score good deals on many items by combining a sale and “cash back”. The cash back I am referring to is that which is earned via shopping portals. For a rather comprehensive primer on shopping portals and how to use them, check out this article I wrote last year. That post explains how you can save 15% (or more) on your gear purchases. When combining cash back with items on sale, the results can be staggering. Indeed, each time I utilized this method at eBags.com (which sells a lot of Patagonia gear), I was able to save more than 50%. Again, most cottage companies don’t work with shopping portals so you’re out of luck there but you should make a habit of checking cashbackmonitor.com every time you make an online purchase just to see if there are any savings to be had. I’m not really into the culture of consumerism that is normally associated with gifts, however if someone is insistent on the practice then I at least try to steer them toward something I might actually use (and implore them to do the same with me!). You’ll likely have a lot if interest from friends and family members about how they can help out with your hike, and if there are a couple of items on your gear list that you still need to purchase then this might be the right opportunity to do so. If you aren’t sure what you need just yet, a gift card to REI can work just as well. 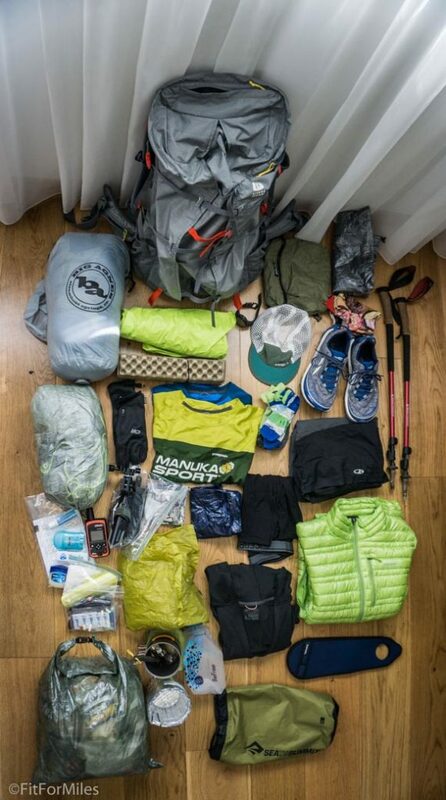 I my case, I received a couple of items as gifts from family members and they ended up being some of my most important pieces of gear (trekking poles and water filter). You shouldn’t expect to have your whole kit given to you, but gifts can hep round out your kit if pieces are missing. During my preparation, I reached out to many companies whose products I enjoy to see if they’d be interested in having me as a representative on the trail. Most of the time I didn’t get a response at all, but sometimes they gave me a discount code or a few protein bars just so I’d leave them alone. I was able to leverage these discounts to save a few bucks on food and things that don’t normally go on sale, like Buffs. Unless you’re looking to set an FKT or the like, I wouldn’t rely too heavily on this avenue. There are lots of other creative ways you can earn extra cash or credit to fund your gear purchases. One example I used was that my health insurance was offering incentives for the completion of “healthy actions” like filling out a survey about my daily activities, enrolling in online nutrition classes, and completing a biometric screening. By doing these tasks (which took maybe two hours total), I received $150 in Amazon gift cards which I could use to pick up trail necessities. Over $4,000 worth of gear, purchased for half that. The fact that I was able to save roughly $2,000 in addition to having a kit that worked almost perfectly for my thru-hike was well worth the significant time and effort I dedicated to finding high quality gear at a discount. In my post thru-hike gear review, I explain how few gear failures I experienced, which I attribute to the quality of the items I had with me. Not everyone wants to spend the time diligently researching and acquiring their perfect kit, and that’s completely fine. In the end, you’ll discover that completing a thru-hike is more about what’s going on above the shoulders than what’s being carried on them. Having the lightest and most expensive gear on the trail is not an indicator of success, but if you have the time and inclination to put in the work ahead of time you’ll be happy you did. If not, there are tons of solid options from well-known outfitters that can be picked up at REI with little to no preparation. I wrote a tongue-in-cheek article about a reliable go-to Big Three that will work for anyone, so feel free to check that out if this isn’t for you. But if this kind of stuff is as enjoyable to you as it is to me, there are lots of opportunities to save a ton of cash without sacrificing quality.